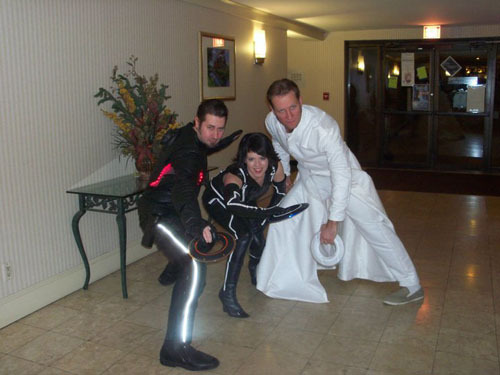 My Quorra costume from Tron was fun and challenging! In this article I will tell you how I went about constructing it! Finding the fabric turned out to be pure luck. I went to one of my local fabric stores here in Nashville, TN called Textile fabrics. They just happened to be having a sale that day for 50% all of their fabric! I was not looking for fabric for myself at the time, but when you spot a deal like this you can’t pass it up. They had a small roll of black pleather fabric for just $7.00 a yard after the discount! While its not the same fabric they used in the Tron movie, it was thin and stretchy enough to look similar while giving it my own spin. The cropped jacket and white strips were both made from discount pleather I found at Hancock Fabrics in Murfreesboro, TN for $6.00 a yard. The first bodice layer of the Quorra costume was made from a pattern I draped on to my body form. 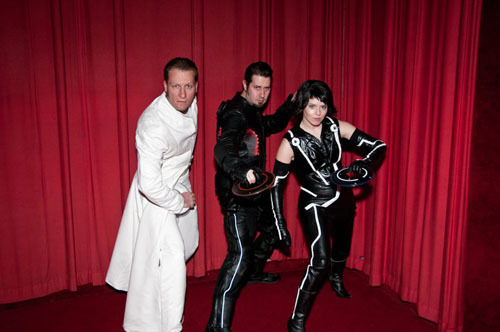 I had to print out several reference shots from Tron Legacy to make sure I got all the angles correct. Since its very fitted, I had to sew a long zipper in the side. You can’t really tell from the pictures, but there are several angled seam-lines running through that first bodice layer. I finished the edges with binding that I made from the same fabric. The sleeves that are cut off at the shoulders are just tubes of stretchy black fabric that I attached to the arm pits of the bodice. The cropped jacket layer was a different pattern that I draped on to my body form. It was a little more difficult to make this because of the dramatic curves it feature on the sides. This jacket is lined in the same pleather to give it more body and weight. I attached the lapel separately by hand-stitching it on. I would have used the machine, but the pleather was way to thick. The jacket closes in the front via hook and eye closures. The pants were not too hard to make. I just had to keep taking them in more and more until I achieved the correct fit. I wanted them to fit as tight as possible without being tights themselves. I had to put a zipper in the side to take them on and off so they would lie flat with the rest of the costume. I was afraid that if I put elastic in the waistband it might look weird. The gloves were made by laying out my hand and tracing around it. Again, I had to take them in more and more until I achieved the perfect fit! This would later prove to make my strips very difficult to apply since they were so small. My boots were found at the local goodwill right down the street! I saw them and thought they would be perfect, so I couldn’t pass up the $5.00 deal! They started out as white with a fur trim. I cut off the trim and painted them with a black matte spray paint normally used for miniatures. The paint cracked a little, but not enough to really notice. The white strips were the hardest part of this costume. I decided to go with a white pleather at the moment, because I didn’t have time to work with the EL wire. I might do EL in the future, or I might add reflective tape/fabric. I had to put my costume on completely and draw on where the white strips should go with chalk. This was very hard, and I had to get Mike to draw on my back and gloves. I had to guess where a lot of these where supposed to go since it was hard to tell from the reference shots. After I drew on the lines, I made the white strips. I cut out the white pleather on the bias and made sewn tubes of white so it would look clean and finished. It was difficult to pin on the white because it was so thick, but I managed. I think I must have stabbed myself fifty times before I got it all sewn on! I had to take apart my gloves in order to put the white pleather on. The final touch was the white strip I sewed on to the boot. My hair was actually a human hair wig I purchased at a local shop. I had to trim the bangs a little to give them that angular look. I also put a litttle baby oil on the wig to make it shine. To make myself look more like a program, I put on a lot of foundation and white pearlescent powder. I really think this completed my look when I wore out that first time at Chattacon 2011! I realized after I put on my costume at Chattacon, I forgot to sew on the last two circles and strips in the front! Oh well, I can complete that before Connooga! 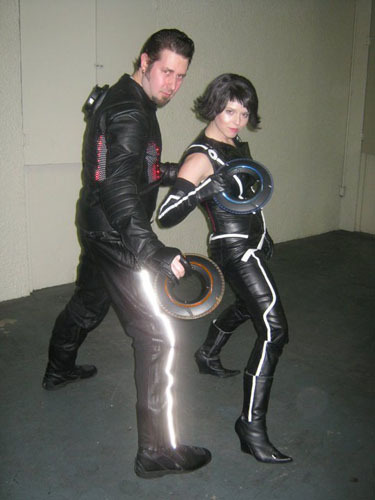 Thank you for reading this tutorial for my Quorra costume from Tron Legacy! That’s a costume I would like to wear someday!